Go to any old, small American town and you will still find the original town square, the seed from which the city’s plans sprouted. For centuries around the world, mankind has assembled in Market Squares and Plazas to practice Free Trade. Free Trade practices supply and demand principles, where price is primarily determined by demand, not by government other than taxes and licensure fees. If supply is high, prices are suppressed. If demand is higher than supply, prices go up to insure that product will be available for those that can afford it. The consumer not only gets the most competitive price but also the best assortment. Sellers are forced to constantly supply better products at better prices, a win/win for the consumer and many times cheaper than a restaurant or chain store. Markets vary regionally. For example, in California, where produce is a year round product, Green Markets offer primarily food, produce and produce related products. Chicago offers French Markets mirroring Parisian Markets, including not only fine French cuisine, but produce and artisan crafts. Florida offers Green Markets. Although Florida grows a lot of produce, agriculture is fourth in industry after International Trade, Tourism and Space Industry. Florida Green Markets are largely dedicated green by shopping center landlords or government, influenced by the brick and mortar retailers and Flea Market owners, hurting for business, not because of consumer need or desire. Florida Flea Markets, hugely popular since the 80’s, created an alternative to shopping malls and made for an inexpensive, family event. They still offer a wide variety of produce, products, daily entertainment and fast food. Most popular in Florida are the Farmers Markets which also offer produce and live plants. The biggest draw to Florida Farmers Markets are the chef-prepared foods, arts and crafts. The unknown differences between a Flea Market and Farmers Market are days of operation, site location and most importantly products. First, Flea Markets and Farmers Markets differ in their hours of operation. Flea Markets are open on weekends like Friday, Saturday and Sunday and they are open year round. Farmers Markets can be found in SWFL everyday of the week in a different location, but only during Seasonal months (October-April) due to the summer heat and rainy season. A few Farmers Markets run year round. To find times and addresses, simply input Farmers Markets in your Facebook Search box. Secondly, Flea Markets have site differences from Farmers Markets. Most Flea Markets were bought on cheap land a couple of dozen years ago on the outskirts of town making it slightly inconvenient for most shoppers. Flea Markets’ parking lots are mostly unpaved from which dirt tends to scatter freely on customers and products. Conversely, Farmers Market Managers complete massive research using traffic patterns in finding a convenient and upscale environment like a Park or Shopping Center, drawing customers from nearby neighborhoods. Those parking lots are paved and landscaped areas keep dirt from leaving the ground. Additionally customers enjoy a fresh setup each day of a Farmers Market so it is a cleaner environment. The most important difference between Flea and Farmers Markets are their products and their appeal. While both have farm-fresh produce and live plants, Flea Markets are typically comprised of mass produced or outlet items , factory and retail closeouts (shoes, socks, t-shirts, sunglasses, reader glasses, ball caps, golf balls, electronics, kitchen gadgets, bargain jewelry, and tools) and distributor closeouts for toiletries. One will also find garage sale items with household items (pots, pans, used clothing, hardware and garden tools, etc.). Additionally, Asian vendors set up permanent shops for imported items like porcelain pots, plant stands, plate stands, carved statues. On a good day, one-of-a-kind antiques are a prize buy. Products may be displayed on ancient, plywood tables, or sheets on the ground or the trunk of someone’s car. In certain areas fast food is available and musical entertainment is provided at scheduled times. If a bargain is the main goal, then go here because bargaining is expected. Farmers Markets, on the other hand, display the smorgasbord of local culture. While prices are a step higher than Flea Markets, so is the quality and you will still find something for every budget. Music, whether by DJ or live artist, is frequently inconsistent and primarily, people go for the fresh seafood, organic, farm-fresh produce, local honeys (good for regional allergies), live orchids and cut flowers. Herbal remedies and essential oils are available to try and buy. Customized, embroidered colorful aprons are available. Soaps are handcrafted with quality shea butters and essential oils as primary ingredients, not chemicals one cannot pronounce. Many visitors come for breakfast and stay for lunch. Global cuisine is endless. Choose from handmade French and German pastries, Organic Juice Combinations, Fresh Bagels, Flagels, Muffins, Cookies, Gluten-Free Breads and Pastries, Latin Empanadas, Guacamole, Tostados and Tamales, Spanish Paella, Mediterranean Baklava and Taboule, French Crepes, Italian, Award Winning BBQ and Smoked Mullet to go. Many chefs are preparing food and able to speak about catering events. But the real local prize and surprise are the artisan crafts often represented by the craftsperson himself. Fabulously popular are colorful hand painted stemware, hand embellished glassware, seashell mirrors, hand painted furniture, wall decor and greeting cards, up-cycled home décor, local photography and of course, jewelry hand-crafted from real gemstones and pearls. Artists put their best prices on their items so dickering is not needed nor expected. All of these items are great for the weekly splurge or the unique gift you need for that special friend. Florida is smart to encourage the art trend of Farmers Markets. Tourists and residents alike say they are a yearly anticipation which is a clear sign this is helping tourism. Today, with the economic downturn, the Green Markets, Flea Markets and Farmers Markets appeal to different tastes and levels of living. Many customers enjoy the variety of shopping for items not available at normal retail stores. Many unemployed have reinvented themselves here, choosing to hedge against job loss by starting their own business or nurturing their art. Liking the low financial risk of Markets as opposed to Storefronts, many spend long hours ordering supplies, displays and tents, produce a sellable product, apply for and hopefully accepted to a market, pay the fees and licensures, fight the heat, rain and cold, set up and break down their entire livelihood on a daily basis just to get you to look in their tent, just one time. Their income provides a living, puts the kids through dance class or pay for the pet’s medical bills, and buys more Market supplies, thus putting money back into the local economy. Many do not succeed. But if it is successful, it is a great face-to-face relationship between seller and consumer. Remember, Buy Local. 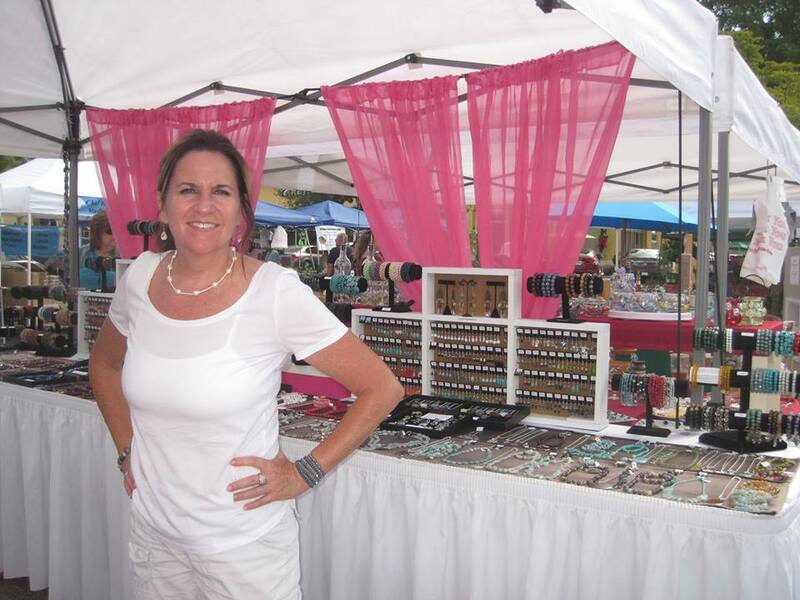 Selling gemstone jewelry at the Market! , featuring 4000 pieces of handmade pearl and gemstone jewelry. She and her husband, David Self, both have 80 combined years of retail experience working as consultants and managers for big box and Fortune 500 companies. They participate in 5-6 Farmers Markets a week. Find them on Facebook.